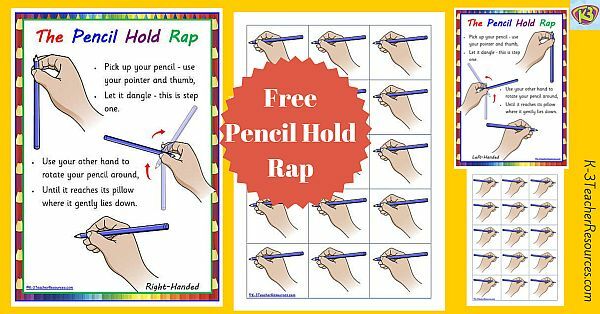 Pencil hold rhyme poster showing the best way to pick up and hold a pencil for handwriting through a little rhyme / rap. Pencil Hold Multi-image Pages – Correct pencil hold images to cut out and pop onto children’s desks / work areas…. Great idea – I am making a copy for each child, laminating it and sticking it on their desk so they can refer to it each time they pick up their pencil, pen etc!!! Just alerting you to the erroneous apostrophe for its. Thank you Pamela – can’t believe I didn’t pick that up – I am human !!! Usually I am so pedantic about that sort of thing – ALL FIXED ! This drives me crazy. So many artists, including youtube kids channels, hold their pens/pencils wrong. I can’t bear to watch it looks so awkward. It teaches children the wrong message, let alone their getting RSI in later years. I’ve started speaking up and just made a comment on a video. Too bad if they react!